Saturday June 25 1910 Lizzie came home early this morning and dressed to go back to Fannies to a morning party at 9.12. I went an hour later. Had a pleasant time. It was a hot day. We came to town for things and home at 4.30. Will was on the car Did evening work and sat on porch. Sunday June 26 1910 I was busy about the work most of the forenoon Lizzie went down to Swishers. It rained a little early in the afternoon. Hattie Ott Fannie & William came out to supper. We had a pleasant visit. 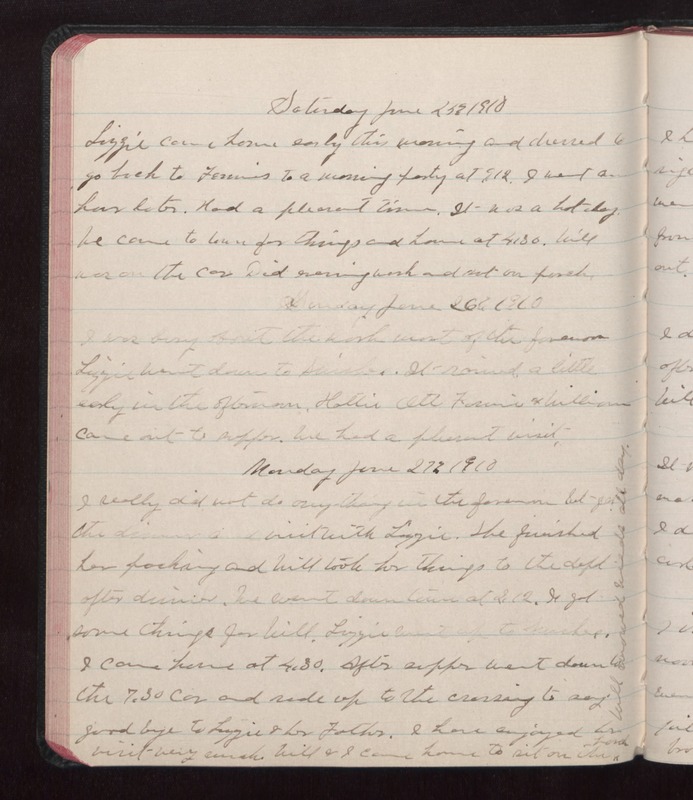 Monday June 27 1910 I really did not do anything in the forenoon but get the dinner and visit with Lizzie. She finished her packing and Will took her things to the depot after dinner. We went down town at 2.12. I got some things for Will. Lizzie went up to Swishers. I came home at 4.30. After supper went down to the 7.30 car and rode up to the crossing to say good bye to Lizzie & her Father. I have enjoyed her visit very much Will & I cam home to sit on the porch Will [illegible] weeds all day.